Beginning Wednesday, Chicago foodies will converge on Grant Park for the 35th annual Taste of Chicago food festival. This year's festival will feature more than 100 menu items from 60 food trucks, pop-ups and restaurants from Chicago's culinary community. 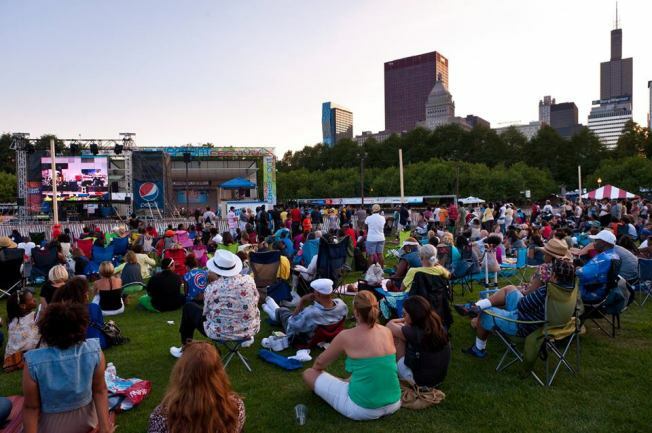 In addition to sampling the diverse range of food, festival-goers can meet chefs, watch cooking demos and attend concerts at the Petrillo Music Shell and the Bud Light Stage. The headlining music acts are Weezer, Erykah Badu, The Chieftains, Spoon and Maze featuring Frankie Beverly. The list of five-day vendors, pop-up restaurants and food trucks include a celebrity chef lineup at the Pure Leaf Celebrity Chef du Jour dining pavilion, which offers a ticketed three- or four-course meal for guests. Celebrity chefs include James Beard Award recognized chefs like Tanya Baker of The Boarding House, Thomas Lents of Sixteen, Giuseppe Tentori of GT Fish and Oyster, Jimmy Bannos, Jr. of The Purple Pig and Phillip Foss of EL Ideas. See a complete list of food vendors here. In anticipation of the big event, the CTA has expanded service, including longer trains on the Red, Blue, Brown, Orange, Green and Yellow Lines from Wednesday through Sunday, when the festival ends. Some bus lines will also feature additional service, including the No. 3 King Drive, No. 6 Jackson Park Express, No. J14 Jeffrey Jump and No. 146 Inner Drive/Michigan Express buses. The Taste of Chicago runs July 8-12. The festival will be open from 11 a.m. to 9 p.m. Wednesday, Thursday and Friday and from 10 a.m. to 9 p.m. Saturday and Sunday.